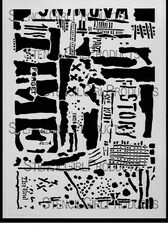 Choose a stencil that includes multiple patterns or words. Pick a palette of 4 or more paints suitable for metal. Start with 3 of the paints and cover the metal with dappled color, applied in a random manner. Move the stencil around and use 2 or more additional colors to add pattern/words till the board is filled. Stencil a set of matching magnets. In case you DO want to duplicate the board as shown, use the Story Time stencil by Seth Apter’s plus metal-suitable paint in 3 shades of green, plus light teal and purple.